The kids are sick. This is not modern youth speak indicating their coefficient of cool; they are actually sick. Joe is ‘nose runny again’ and taking out shares in his parents’ bedroom by night and Lily has been off school for a week and working on her amateur dramatics skills at every opportunity with her parents. In my opinion she still has a long way to go. Nothing big, exciting or clever in the illness department. They will recover and all will be well again. And in the meantime I am grateful for being able to grab a few hours today to make progress in a number of important areas as my parents have bravely stepped in. I have not been able to interest the children in crafts or other messy activities and would not want to while both have the attention span of a goldfish in a forgettery. 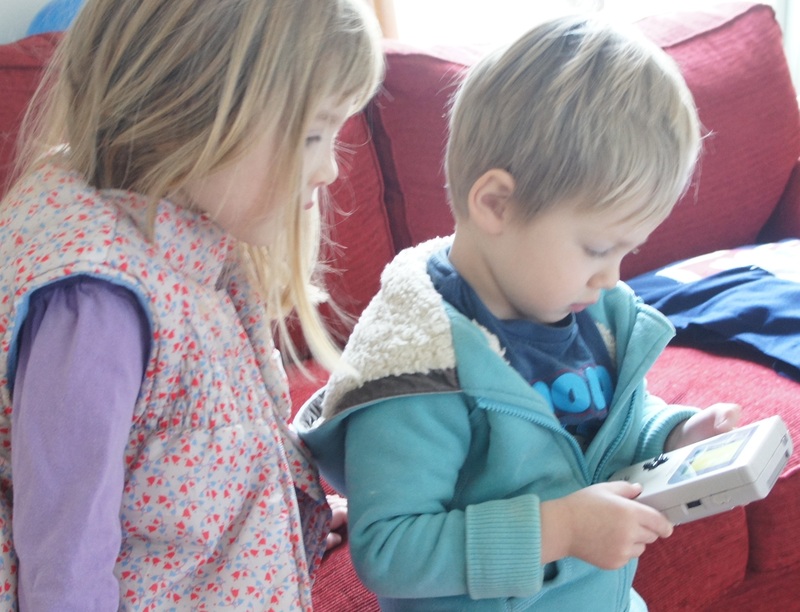 Parking children in front of a TV (short programmes only) or allowing them to play educational games on the CBeebies website has been particularly successful, but not the ideal situation. They are not in a useful state for helping with chores, sadly. So I raided my brain and realised that there were some other ideas. Back to Old School play. 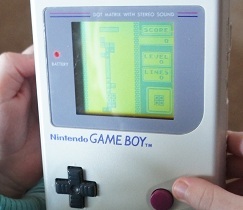 My sister – the one who makes films – recently let me have her old Game Boy. Wow – that brought back a few 90s memories. 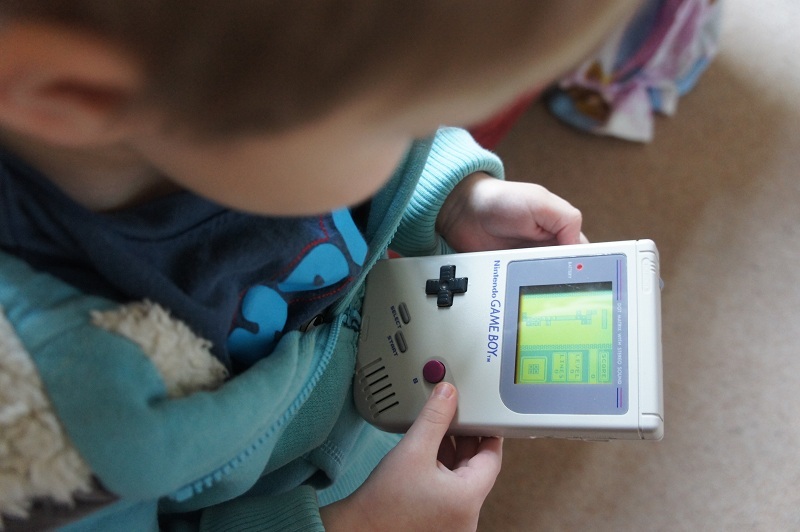 I was so jealous of the kids who had these when I was younger. It was a very long ferry trip for the German exchange as one of the few 13 year olds not to have one. But they are good for heuristic technological play, as it turns out. My son can now play ‘Stack the Shapes into a Really Interesting Tower’ which – at Level Zero – buys me enough time to put a load of washing on. And his sister can practice her Being A Teacher and Telling Him All She Knows about technology from a previous generation. Because she loves history so much. And also how to make it start again. I expect it won’t be long before he is better than me, but I will not be publishing evidence of that, clearly. 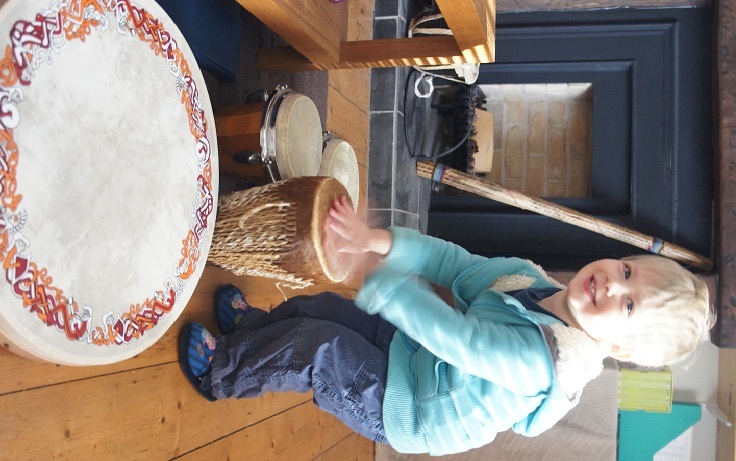 Then there’s the game of What Ancient Objects Can We Find In The House Which Can Be Used For Creating Music? He doesn’t really have an invisible left hand, that’s just his rhythm-copying. Educational? I should think so: international drums, music and history lessons all without trying too hard. I guess it goes to show you can always benefit from having a few things in the house that you don’t mind being hit by a two-year-old. Especially if they are not people. And then I was feeling so nostalgic, and excited that Joe may be tall enough to visit Legoland this year, and enthralled to have discovered letsbuilditagain.com that I invited him to help me rebuild my Best Christmas Present Ever. 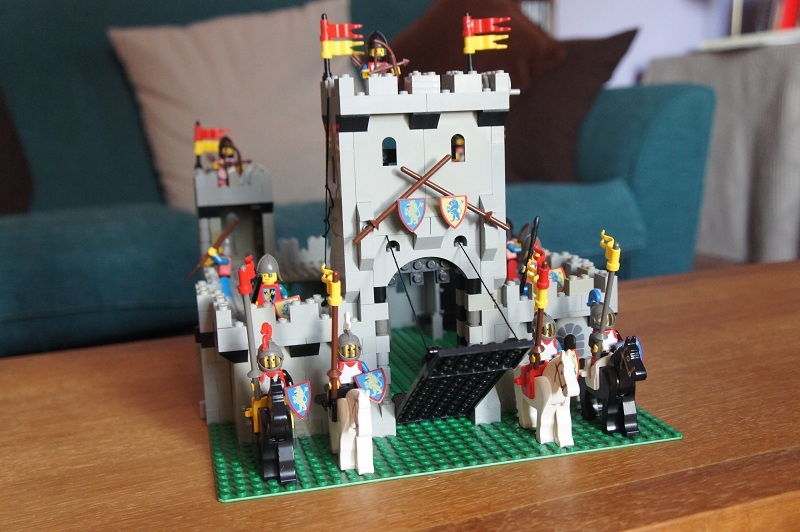 Released in 1984, Lego Castle model 6080 is quite something. By this point Lily was back on the computer games, and I don’t blame her. What used to take an afternoon of sorting and building took three or four sessions with Joseph, much of which was spent explaining how to place things symmetrically and not to hurt your fingers or mix the wrong lego trousers and tops. Fashion, history, technology, maths… who needs school? I even had to get out two pairs of tweezers to rescue the lego string and had to substitute half a dozen pieces of highly hooverable shape from other sets of more interesting colour. This is proper lego. This lego actually weighs a serious amount. It smells of the mid 1980s. It makes me happy deep inside. All this was lost on Joe, who thinks it is a glorified drawbridge (it is a wonderfully glorified drawbridge in fact). It turns out several other female friends had the same set when they were younger. So perhaps I should shift the Lego Friends and pursue a more historical and adventurous agenda with Lily. When she gets off the computer, that is. This entry was posted in Dad, Joseph, Lily, Me, Mum, School. Bookmark the permalink.